When the soldiers had crucified Jesus, they divided his clothes among the four of them. They also took his robe, but it was seamless, woven in one piece from top to bottom. So they said, "Rather than tearing it apart, let's throw dice for it." This fulfilled the Scripture that says, "They divided my garments among themselves and threw dice for my clothing." So that is what they did. 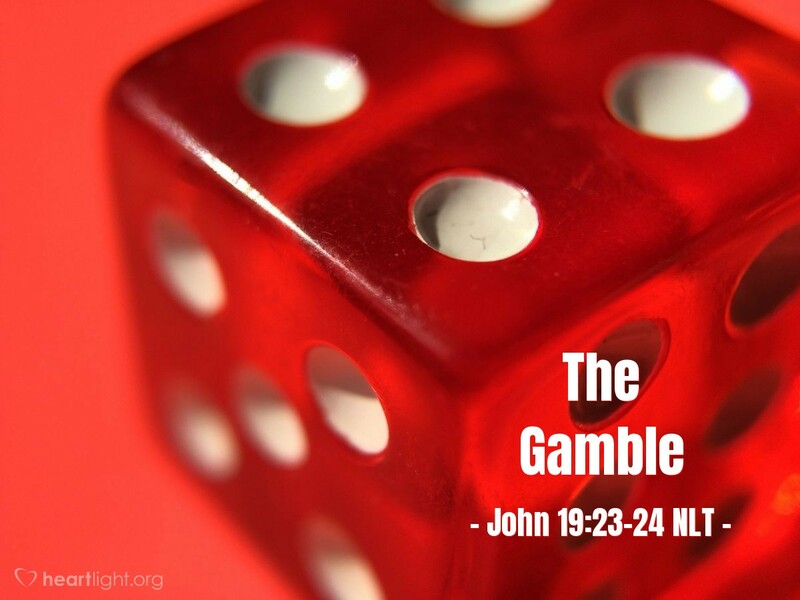 There was a whole lot more gambling going on at the cross than just the gamble for Jesus' seamless robe. Some gambled that their understanding was correct enough to put another man to death even though he did amazing things. Some gambled that Jesus was just another Jewish criminal being executed, never imagining they were putting nails through the hands of God himself. Others gambled that their mockery was justified and had a worthy target. No one should look at the cross and then reject it without realizing the horrible gamble being made. If Jesus is the Son of God, then everything is completely different ... new ... clean ... holy! Father, I am simply amazed and stunned at your bold "risk" of love in Jesus. We, your people, have often rejected your greatest gifts of love. How could you keep loving us so much, Father, that you would offer, and dare I say it, risk, such a costly gift? I do not understand it, but I do believe it, and I offer you my life, my love, and my all in Jesus' name. Amen.